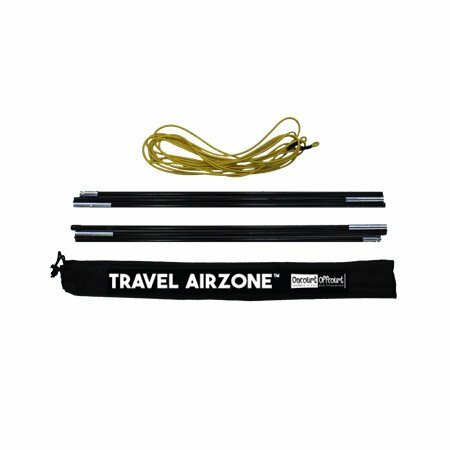 The Travel Airzone creates a raised net to help players visually learn to hit with more net clearance. This is the first ultra-portable way to raise a tennis net for accelerated learning. Great for players, pros, and coaches with limited storage space or to use while traveling. HOW IT WORKS: The Travel Airzone creates a raised net (up to 8 feet above the ground) to help players visually learn to hit with more net clearance. EXTREMELY PORTABLE: This is the first ultra-portable way to raise a tennis net for accelerated learning. Great for players, pros, and coaches with limited storage space or to use while traveling. PROFESSIONALLY MADE: All our products are designed by Tennis pros with years of experience and expertise. ONCOURT OFFCOURT: We are the leading creative resource for youth tennis, training aids, court equipment and ball machines. Over 10 million players have improved using our products in over 100 countries.